The Eagles are suing the Hotel California in Baja, Mexico for trademark infringement in relation to their 1976 signature song of the same name. According to The Hollywood Reporter, the lawsuit claims the business has gone out of its way to imply association with the legendary band. "Through advertising targeted to U.S. consumers, and in-person communications,” writes attorney Laura Wytsma, “Defendants lead U.S. consumers to believe that the Todos Santos Hotel is associated with the Eagles and, among other things, served as the inspiration for the lyrics in 'Hotel California,' which is false. "Hotel California" isn't just a hit song or the title of the Eagles' most successful album, it's the "essence of the band itself." The small hotel originally opened under the name Hotel California in 1950 but went through subsequent ownership and name changes. When Debbie and John Stewart bought the hotel in 2001, the complaint states, they sought to revitalize it by creating a reputation "based at least partially on the hotel's reputed, but false, connection to the Eagles." Wytsma says the hotel also plays Eagles' music and sells T-shirts that refer to the hotel as "legendary," which leave consumers with the impression that "they have visited 'the' Hotel California made famous by the Eagles." The Eagles are seeking an injunction to ban the hotel from using the name Hotel California or doing anything else to imply it is connected to or approved by the band, and are asking for all related profits plus actual and exemplary damages. 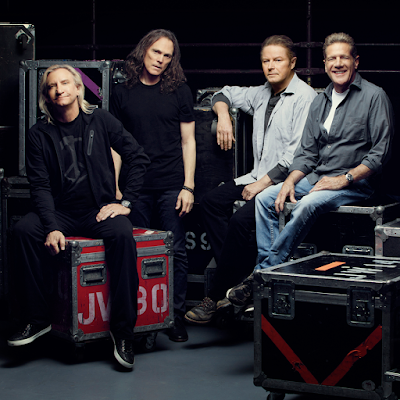 The title track to the group’s fifth record, “Hotel California” peaked at No. 19 on the US Billboard Hot 100 while the album hit No. 1 on the Billboard 200 on its way to US sales of 16 million copies and more than 32 million worldwide. The Eagles are teaming up with Fleetwood Mac to headline a pair of festivals this summer. Organized by manager Irving Azoff and reportedly inspired by the success of the Desert Trip events last year, the bands will perform at The Classic West festival at Dodger Stadium in Los Angeles and The Classic East at Citi Field in New York.